My name is Steve Geick and I am the President of Yukon Employees’ Union. We are a component of the Public Service Alliance of Canada in Whitehorse Yukon, representing approximately 5000 members across the Yukon Territory of Canada. In March I traveled to Guatemala with a group of Canadian volunteers to learn about the realities of life and the work of several social justice organizations supported by the PSAC. We began in Guatemala City but spent most of our time visiting the highlands in the Lake Atitlán region. We had to cancel a trip to the village of Coban. We had planned to work on roof repairs at a school named for the father of a member of our Canadian team. Roberto Miranda was a trade unionist who believed in the power of solidarity. He worked to organize teachers with his brothers who lost their lives for their efforts. A young father, he fled Guatemala in the 1980’s after his life was repeatedly threatened. He moved his family to Canada, but continued the work he began in his home land. For many Guatemalans, he is a hero. In the few days before our scheduled visit, life in Coban was threatened by armed militia. As in many Guatemalan villages, the campesinos are squatters on state land. The purchase of land is very difficult and expensive, and most privately owned land is held by the very wealthy. A powerful plantation owner decided he needed the land on which the village stood so a private guard of armed militia came to town and ordered the villagers out. When they refused to go, the private army returned with more than 30 men bearing automatic weapons. The local police force did little to interfere, and 126 villagers were locked in the village church and told the church would be set on fire. Thankfully the villagers escaped into the jungle. A handful of these escapees made it to Guatemala City, assisted by members of the CCDA and Break the Silence, to meet with the United Nations and high ranking Justice officials. In the days since our return, the militia has left Coban and the villagers have slowly begun to return from their hiding places in the jungle. It’s against this backdrop that the Campesino Committee of the Highlands (CCDA) has grown to over 360,000 members. Founded in 1982, the organization works to defend the rights of workers on large coffee, sugar and cotton plantations. They also work to recover lands taken from the Mayan communities over the past centuries. In many ways, the efforts of the CCDA mirror those of Canadian First Nations activists, and the parallels between treatment of indigenous peoples in Canada and Guatemala are stark and tragic. When it formed, the organization was considered a threat to the government and many of its founders were “disappeared”, exiled or assassinated. CCDA was granted legal status in 2000, and now supports economic initiatives and social infrastructure development throughout the region. The main fundraising component of the CCDA is its Café Justicia project. 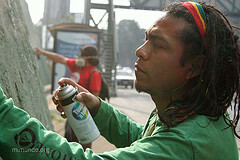 When Guatemala’s civil war ended in 1996, the CCDA began using funds from peace accords to obtain land for its members. Cooperatives of farmers in the highlands now produce over 60,000 pounds of organic coffee, the best of which are purchased by the CCDA for export as Café Justicia, a Fair-Trade Plus brand. Through the funds raised by their coffee, the CCDA is able to assist villages that have not yet achieved self-sufficiency, building schools, clinics and community centres. Our party of 12 included three Yukoners, one Manitoban, a Nova Scotian and a handful of activists from Ontario. Our trips were funded either through our own fundraising efforts or by the organizations we represented. While in Guatemala, we knew we were going to work hard and live rough. No fancy hotels or restaurants for us. 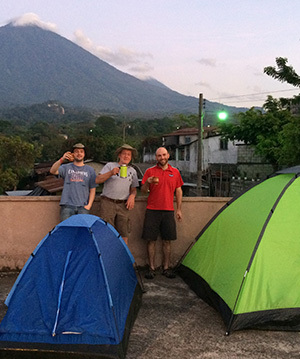 The itinerary was packed with opportunities to learn about the real history of Guatemala. We saw the strength of its indigenous people and their pressure for social justice. We also saw the legacy of violence and grief from 30 years of civil war. We met with activists, teachers and their students, farmers and villagers. 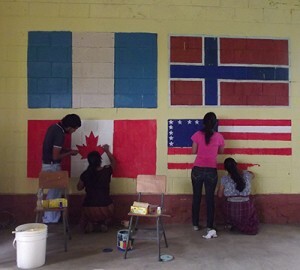 We helped build two community centres, repaired a school roof and assisted at a community medical clinic in Quixaya. It’s not enough to say that this trip changed me. The determination of the Campesinos and the achievements they have made to improve the lives of their members amaze me. The Hijos or youth activists whose family members were “disappeared” during and after the civil war work with steely determination to ensure their loved ones are never forgotten. Their efforts to hold police and the paramilitary to account while striving to defend marginalized youth from police violence are staggering in their audacity and strength. I’m awed by women who support their communities through artisan and agricultural cooperatives, accessing micro-loans for projects to build capacity and self-reliance. 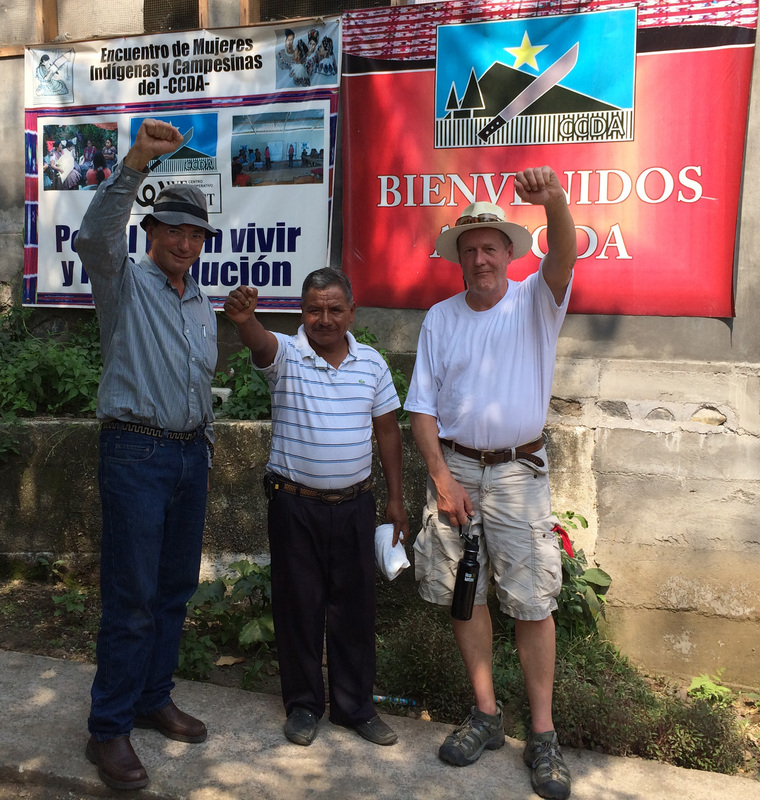 Most of the people I met in Guatemala were poor subsistence farmers and villagers. In their poverty there was strength, determination and the quiet confidence that solidarity can provide. No-one who belongs to an organization of 360,000 members is alone. There’s no question who holds the power in the hills of Guatemala. It’s not the peasants, or Campesinos. It’s not the villagers, teachers or farmers, or even the doctors and nurses trying to provide medical care to people not even registered with their government. It’s the plantation owners, the wealthy. It’s the armed militia backed by silent money and invisible alliances between land owners and the state, between foreign corporations and corrupt leaders. This is changing, however. Slowly but surely the power is beginning to be more evenly distributed. Through pure force of will and ingenuity, the CCDA’s committed activists and citizens work for one another, with the support of international partners like the PSAC. I am very proud to have been amongst this year’s contingent of observers. We will continue to honor the work they do, and we will continue to bear witness to the struggles they face. You can purchase Café Justicia in Whitehorse through the PSAC Regional Office and committees; call 667-2331. A small selection of the coffee will be available for purchase at the YEU booth at the Yukon Trade Show May 2-4 2014. June 19, 2014 UPDATE – Related News: Landmark Suit against Canadian Mining firm filed in BC. Human rights group seeks to hold BC-based company liable for shootings at Guatemalan mine.